This was a more adventuresome dinner than anticipated. Yusuke saw a grocery store ad for oysters and had the idea to make mixed rice with oysters. So I bought some. However, when we took the oysters out of the fridge to start cooking, we realized that we didn’t know how to open them. The halves of the shells were solid with no discernible gaps. Hmm. After a few feeble attempts with butter knives, we did what any red-blooded librarian would do. We googled “how to open oysters,” in English and Japanese respectively. The internets offered a clear answer: use an oyster knife. Oh. But we were hungry and not particularly inclined to go on an oyster knife shopping trip. So Yusuke tried something else. He smashed the end of the shell with a hammer to create an opening in which to put a knife to pry the shell open. While effective, this method resulted in a fair bit of shell shards and ocean grit on the sink, counter top, and floor. Anyway, when the dust cleared, we had a truly pathetic amount of oyster meat in the pan. In my naiveté, I had only bought ten oysters, when two dozen probably would’ve been more appropriate. But no matter. Yusuke made a yummy dinner anyway. He boiled bamboo shoots and the oysters in a broth of soy sauce, mirin, sake, and salt, and then added it all to the rice cooker to cook the rice. The rice was fabulous, and the oysters were delicately oceany. We opted for simplicity with the soup: miso with spinach and eggs. 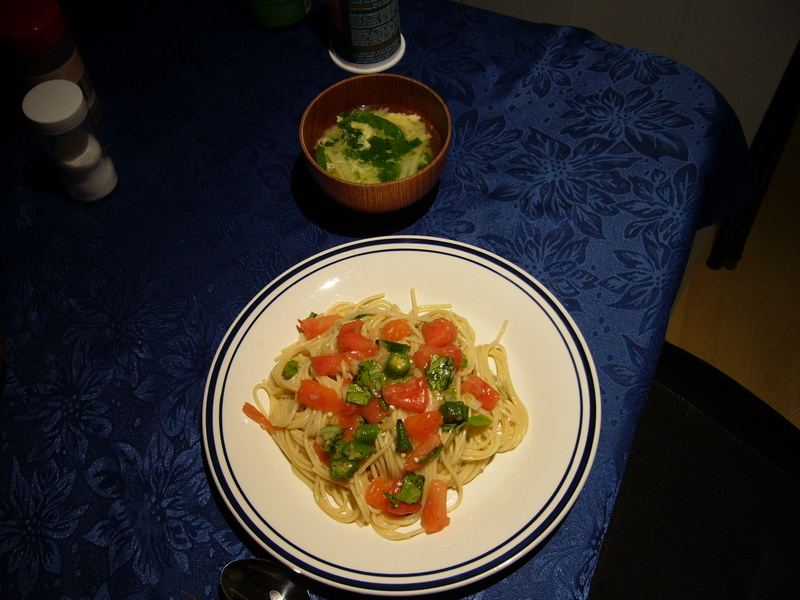 This fabulous dish is spaghetti, served cold, topped with chopped okra and tomatoes. Yusuke tossed it all with a mixture of olive oil and garlic. 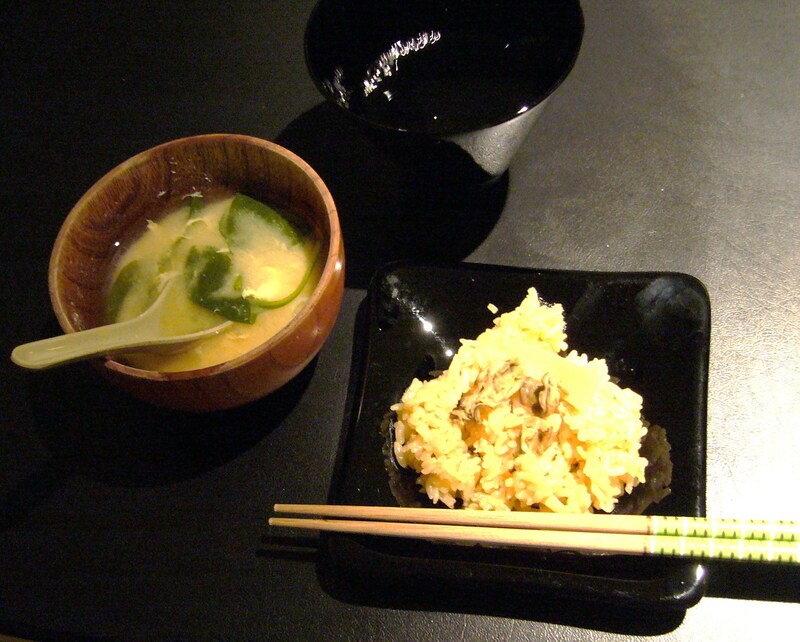 The soup base is chicken broth with bamboo shoots, baby spinach, and eggs—an unusual and tasty combination. This is one of my most favourite dishes, which is simply called “mixed rice.” The rice is cooked with mirin, sake, and soy sauce and then mixed with sauteed veggies, in this case: bamboo shoots, shitake mushroom, and onions (he frequently uses carrots, too). This version also includes abura-age (a deep fried tofu sheet). 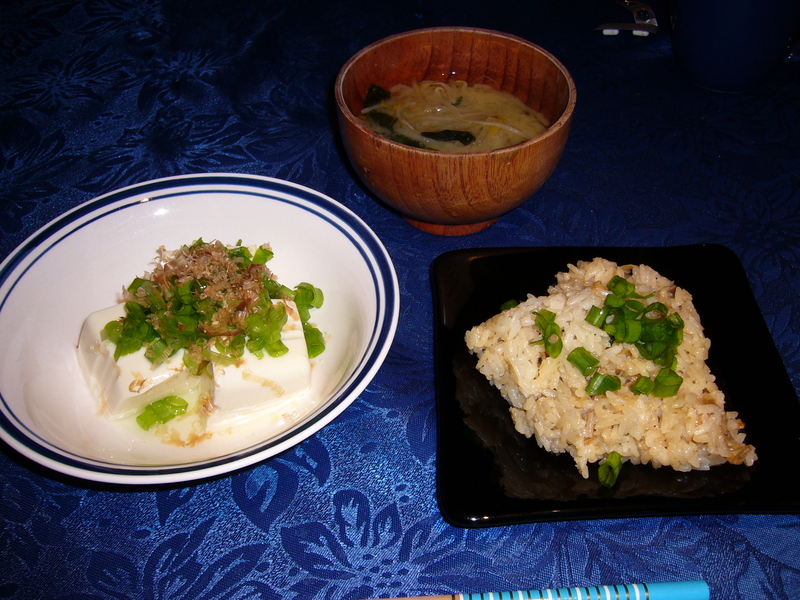 Our side dish is yudofu, aka boiled silken tofu topped with bonito flakes, ginger, soy sauce, and green onions. Heaven. The soup is miso with bean sprouts and seaweed.